You have the right to remain silent…so, why don’t you? What you say CAN and WILL be used you (seriously)! I think it is important to discuss the importance of exercising constitutional rights/freedoms. 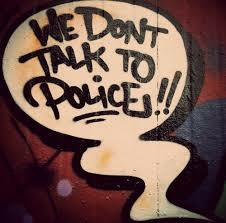 In particular, the right to remain silent when being questioned by law enforcement about alleged criminal activity. Why does this seem to be the one freedom that no ordinary citizen wants to evoke? It is understandable of course – to a point. Yes, you want to be respectful and cooperative to with the police in the course of their investigation. This means conducting yourself maturely and appropriately, and politely advising the officer that you wish to exercise your right to silence – meaning you do not wish to have any further discussions whatsoever. And you definitely are not taking the lie detector test. There is a difference between cooperating and conceding. Exercising your constitutional right to remain silent does not indicate guilt – it does absolutely nothing except protects your best interests, liberty, and quite literally your freedom (depending on circumstances). Assuming guilt as a result of silence is what’s known as an adverse inference – and in the realm of criminal justice in Canada, an Accused person is protected from such an insinuation. So, there really is no downside to the advice that seems to evade people during times of crucial importance: don’t talk to the police. Remain silent. Protect your best interests. Seek legal advice. Trust the guidance you receive from seasoned legal professions. We have dedicated our livelihood to protecting the fundamental and inherent rights awarded to every single individual in this country – but in order to obtain the best possible outcome, you, the client, must have confidence in your legal counsel’s ability as your advocate. This is best demonstrated by being mindful of the first piece of advice you will receive: DO. NOT. TALK. TO. POLICE. Instead, advise them that any dealings they wish to have with you should be done through your criminal defence lawyer. Once retained, a criminal lawyer becomes the conduit between you and the police. This not only ensures that all communications will be appropriate and methodical – it also provides a new point of contact for the police generally. 4) You have reason to believe you will be investigated, arrested, or charged in the near future. Whether the crime is violent (assault, aggravated assault, sexual assault, assault causing bodily harm, manslaughter, murder), financial (fraud over/under $5,000, possession of stolen credit cards, forgery), or falls under any other category, the experienced criminal defence lawyers at Tarnow Law Offices are well equip and ready to help navigate you through this difficult time from start to finish. Ian Pumphrey was back before the Yukon Courts earlier this week to represent himself in an Appeal launched by the Yukon Government. In January of 2015, the Honourable Judge Luther found that Pumphrey wasn’t breaking the law by talking on the phone while driving, having his cellphone suspended between his ear and shoulder. It is, of course, illegal to drive while talking on your cellphone in the Yukon Territory – however, hands free devices are permitted. Since Mr. Pumphrey clearly was not using his hands to talk on the phone, he was not in violation of any regulations of the Motor Vehicle Act. The Yukon Government appealed Judge Luther’s decision before a Supreme Court Judge, saying that in dismissing the ticket, he took the meaning of “hands free” too literally. Mr. Pumphrey is of the opinion that the Government’s appeal is a waste of time and money – that would be better spent clarifying the legislation. He also stated that he will be seeking $15,000 in compensation from the Yukon Government in relation to all of the time he has spent working on the Appeal. The Supreme Court Judge reserved decision on the matter. This week, British Columbia’s Attorney General, Shirley Bond, announced that the government would abandon the direction it gave to Crown prosecutors to make Applications to televise the legal proceedings of those accused of crimes relating to Vancouver’s Stanley Cup riot. The government appears to have had this change of heart after it’s first Application was dismissed against Mr. Ryan Dickenson – who is the first person being sentenced in in relation to the riot. The judge felt that the Crown did not provide enough information to support the Application – namely the cost associated with televising these legal proceedings. I really could go on & on about how inappropriate I felt these “RiotTV” applications were in the first place. I am a firm believer that cameras have no purpose in our courtrooms. Of course, there is the reasonable argument of transparency and that having cameras would better educate people on how the justice system functions. But to those people I say walk down to your local courthouse, read case law, order transcripts of court proceedings, if you’re so inclined. The risks of having cameras in courtrooms, in my opinion, far outweigh the benefits. A criminal trial is a ‘truth-seeking’ exercise. Witnesses may be hesitant to give full accounts of their evidence if they know the world is watching them. Lawyers may tailor their questioning of witnesses for the same reasons. Judges may be reluctant to decide a case in a certain way if it is deemed to be unpopular with the public. Prosecutors worry about their personal safety. In fact, all participants in a criminal trial worry about their personal safety. No one wants their face frozen in time on YouTube – and in this day and age, that is what happens. I see what happens on TV in American courtrooms and I do not want Canada’s justice system to go there. But why did Premier Christy Clark demand that these particular offenders be put on TV? She said something along the lines of “well they committed their crimes on camera, therefore they should have no problem being dealt with by the courts while on camera”. The logic in that is ridiculous. I have had dozens of clients who’s criminal acts have been captured on CCTV cameras – for murder, break & enter, sexual assault, DUI’s and drug offences. Crimes, which I argue, are far worse than some of my clients who stand charged in relation to Vancouver’s riot. So why didn’t the government seek to televise these other crimes caught on camera? Because there was nothing to be gained politically from doing so. The fact of the matter is this: June 15, 2011 was an awful day in Vancouver’s history and the government tried to gain politically from what happened that day. In doing so, they tried to interfere with the justice system’s independence. This ultimately blew up in their face. The BC Liberals are quite out of touch with the ailing state of our justice system – and it is largely due to the financial cutbacks they imposed over the last decade. Legal Aid is seriously reduced for those who need legal representation. We need more judges. We need more sheriffs. The system is in crisis. RiotTV was nothing more than a political stunt. I accept that being “tough on crime” is attractive to voters – but the manner in which the government tried to appear tough on crime was only intended as a diversion from the real problems our justice system is facing. I think the public saw through the political stunt from the beginning – and the public will remember this when the next provincial election is called.